A deep crimson red garnet gemstone sits in the middle of a polished cross in Apples of Gold Jewelry's plain garnet cross necklace in 14K white gold! 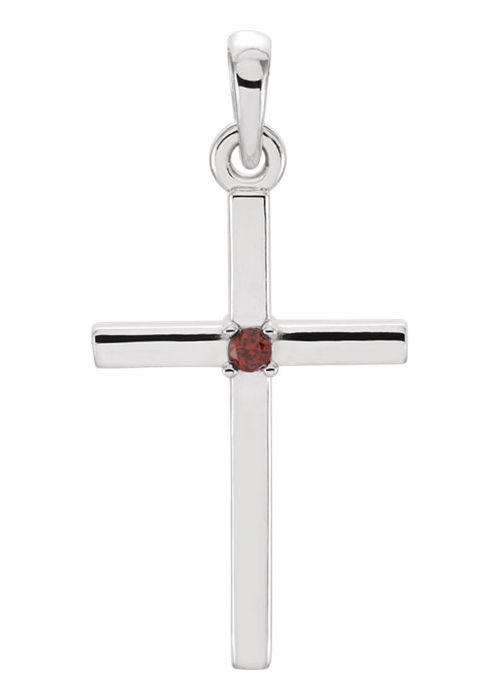 The genuine garnet gemstone that sits in the middle of this highly polished, white gold cross pendant is nestled into the cross with a prong setting. The garnet gemstone, with its deep red color, is 1.75mm in size and AA rated. The overall dimensions for the pendant are 1 inch in height and 1/2 inch in width. "But the fruit of the Spirit is love, joy, peace, longsuffering, gentleness, goodness, faith, Meekness, temperance: against such there is no law. "(Galatians 5:22). We guarantee our Plain Garnet Cross Necklace, 14K White Gold to be high quality, authentic jewelry, as described above.